ATFIRST | rakusol asia pte. 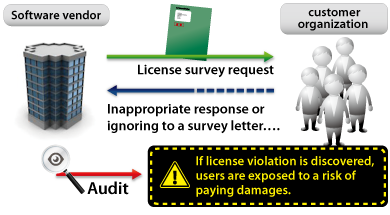 ltd.
ATFIRT is the only software available that can fully minimize the risk of license violation. Software vendors are now exercising their rights to request their customer organization in a survey of the number of licenses in order to ensure software license compliance. Not to mention the major software vendors such as Microsoft, Autodesk, Adobe System, and Just Systems, but also other vendors are focusing on the software license survey. If the customer organization is not responding to a survey, an audit request will come, and if the auditor discovers license violation of the customer, in many cases, they will be asked for the payment of damages and settlement. 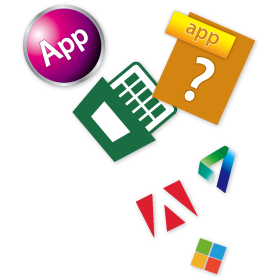 Customer can respond by themselves to license review from software publishers with minimum effort and cost. when customers respond by themselves to license review from software publishers, it normally takes three to twelve months to complete. With ATFIRST, customers will only take about a month to respond to it. Software publishers determine if subsequent action should be taken or not based on the customer’s response. Quick and appropriate response to license review with ATFIRST can greatly reduce risks associated with license compliance violation. Using ATFIRST can spread awareness of license compliance across your organization. Moreover, using ATFIRST can help everyone in your organization understand the knowledge about complicated and incomprehensible license types. Our license dictionary in ATFIRST is not a typical software dictionary which many other vendors are using, but a license dictionary which allows multiple software to be managed by each license. The license dictionary in ATFIRST already has tens of thousands of license information with which customers can match installed software with its license at a rate of 80 to 99%. This can also contribute to reducing the workload of IT department. ATFIRST can provide a great way to distribute the workload of license management to your office staff. Not only does IT department register all license related information, but also each department staff directly keys in necessary information which each department only knows. In this way, it can greatly reduce the management cost of IT department. As for licenses collectively purchased by IT department such as volume license, the IT department can centralize the management. The “Usage” feature helps measure your software usage status and offers a better use of license.